This review I wrote as a result of testing several Compact, Hi-Intensity Flashlights was first published in Sea Kayaker magazine. A new breed of flashlights for sea kayakers and other boaters in need of a powerful package compact enough to fit in the pocket of a PFD. Expedition paddlers exploring unfamiliar coastlines are almost certain to eventually get into a situation that requires paddling at night. Despite careful pre-trip planning and studying charts to look for possible landing and camping sites, many factors such as weather, fatigue or accidents can cause delays that require navigating in darkness. This can even happen on a simple day trip, so all paddlers should be prepared for paddling at night. Some type of bright light is required safety equipment for alerting other boaters as well as for finding a hospitable shore. A powerful light is also especially useful for picking up reflective channel markers or the reflective tape on your partner’s PFD or kayak from a long distance. When I first started taking long kayak trips almost 20 years ago, I carried a powerful underwater light designed for scuba diving at night. This light was a bulky affair—about five or six inches in diameter, like the 12-volt spotlights designed to plug into a cigarette lighter outlet in a car or boat—and powered by eight D-cell alkaline batteries. 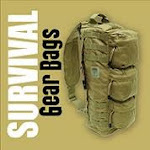 It was bright, though, and completely waterproof, and held up on two trips lasting several months. The problem with the dive light was its size and shape. It was too big to go anywhere on deck and it was even an awkward fit in the cockpit. I normally kept it between the seat-back and the rear bulkhead while traveling, but that made it difficult to get to. It was expensive to purchase and expensive to run with less than two hours of burn time on a fresh set of the best alkaline batteries. The size and weight of all those D-cells limited me to carrying only one or two spare sets. When this light finally died after years of hard use, I went through an assortment of cheaper, less durable alternatives powered by a single 6-volt lantern battery. None of the compact flashlights I carried for use around camp could compare to these bigger, more powerful spotlights that were so useful for scoping out a strange shoreline from a safe distance before landing. A variety of high-power flashlights are now available in compact sizes. They are powered by 123A 3-volt lithium batteries, the same type used for many cameras and other high-drain electronic devices. Some of these lights are only slightly bigger than the popular compact flashlights that use two AA 1.5-volt alkaline batteries, but they are far more powerful. I recently tested two of these that are powered by three 123A cells and another pair that use just two cells.The three-cell lights are much more expensive and slightly larger than the two-cell lights but are powerful enough to replace the large bulky spotlights I used to use. The lithium batteries are only 1 <3/8> inches long (compared to 2 inches for a AA battery), so even the three-cell lights are small enough to carry any time you go paddling. They provide a bright, broad beam of light that is useful to a kayaker looking along the shore for a place to land. All of these lights use Xenon lamps. Xenon is an inert gas that fills the lamp bulb to allow the filament to burn hotter and brighter without burning out. 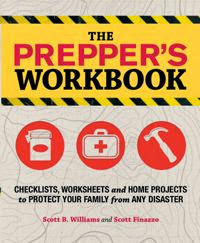 They all produce a clear, consistent beam without the usual varying rings of light typical of standard flashlight beams. To test the lights, I took them for a night paddle along a heavily wooded, swampy lakeshore. The M3 Combat Light is the largest and by far the most expensive of the four flashlights I tested. 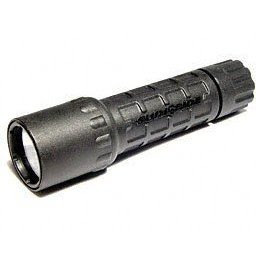 At $252, it’s billed as a “heavy-duty tactical flashlight to meet the needs of demanding customers such as military special operations units, SWAT teams and other law enforcement professionals.” The case is anodized aircraft aluminum with a checkered grip especially designed for the Rogers/SureFire combat grip—a technique used by the aforementioned customers when engaging opponents in the dark with a handgun. Sea kayakers won’t need that particular design feature, but the no-compromise quality built into this rugged light makes it a good choice for the demands of an expedition. Although not rated for underwater use, such as diving, SureFire claims that all its current lights are waterproof to about 33 feet. I left it under about three feet of water overnight and found no moisture had entered the case. The switch is built into the tailpiece—turning it full clockwise turns the light on—but the tailpiece also functions as a momentary push-button switch when partially rotated. Backing the tailpiece off by turning it counter-clockwise disables the push-button feature so the light can’t be accidentally activated when packed. The M3 comes with a 225-lumen lamp and a 125-lumen lamp. On a set of three batteries, the 225-lumen lamp provides only 20 minutes of run-time, and a 125-lumen lamp runs one hour. With the high-output lamp installed, the M3 is by far the most powerful of the four lights I tested. This light provides a useful range of at least 200 feet, completely illuminating the dark woods of the lakeshore I paddled along from that distance. The beam it throws is perhaps not as broad as my old diving spotlight, but it is amazingly intense for such a small package. I even took it out for a drive on a deserted country road and found it bright enough to drive by, held out the window of the car with the headlights turned off. Reflective road signs were visible over a half a mile away. At just over seven inches long and with a bezel diameter of 1.62 inches, the M3 may not fit in small PFD pockets, but it’s still compact enough to carry in a chart case or perhaps secured with a Velcro loop to your PFD. A lanyard is included with the light. With the high-power lamp, it will burn through 123A batteries in a hurry, but for such power that’s a reasonable trade off. SureFire sells its own brand of lithium batteries in a case of 12 for $21. These batteries are so small and lightweight, a kayaker could carry several cases on a long expedition. 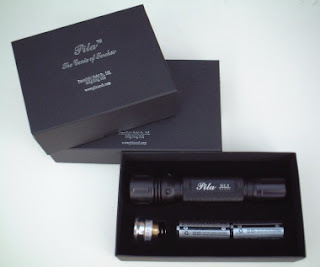 The other three-cell 123A flashlight I tested was the Pila GL3 from Permalight. A bit more compact than the SureFire M3, the Chinese-made Pila GL3 measures just over six inches in length and has a bezel diameter of 1.3 inches. Like the M3, the case is also anodized aircraft aluminum, but inspection of the threads inside the screw-on bezel and tailpiece revealed some rough surfaces and possible damage that might interfere with removal and replacement over time. This light did leak inside the bezel during an overnight immersion test, but it is only rated as splash proof. Despite the water intrusion, the light continued to function perfectly while wet and after disassembly and drying. The biggest difference between the Pila GL3 and the SureFire M3 is the addition of a red four-LED light built into the tailpiece. Like the M3, the on-off switch for the light is a rotating tailpiece that also functions as a momentary push-button switch. The distinction is that the red LED light comes on first as you begin to turn the tailpiece clockwise. Turn it a bit further, and you can use the push-button to turn on the main lamp. Turning it fully clockwise turns off the red LED light and turns the main lamp full on. I like this red LED feature a lot. It’s handy to have both a high-power spotlight and a red lamp for reading charts without ruining night vision all in the same compact package. The red LED light is plenty adequate for following a trail through the dark woods at night or for chart work or other tasks in the cockpit such as searching through a dry bag for a snack, and the current draw in this mode is so low that it will burn up to 60 hours in continuous operation. The Pila GL3 will also operate on two included lithium-ion rechargeable batteries that can be recharged in just three hours. (These batteries weren’t available during my testing.) This is a nice alternative to the 123A batteries if you’re just using the light for short trips or the occasional night paddle. The white Xenon lamp in the GL3 has an output of 130 lumens, comparable to the lower-powered lamp provided with the SureFire M3. The GL3 will run for a continuous 50 minutes on three 123A batteries using this lamp. In a run-time and output test, I found the M3 (with the 125-lumen lamp) and the GL3 to be about equal. The Pila GL3, being a bit shorter and slimmer, is somewhat easier to stow in a pocket than the SureFire M3, yet still produces comparable output. The red LED is a nice addition, and although it is not as nicely machined as the M3, at about $85, the price is a lot easier on the expedition budget. The model I tested has now apparently been changed, with a redesigned case and a 200-lumen Xenon lamp. The upgraded model is available with a variety of LED tailpiece and switch options. I also tested two smaller lithium-powered flashlights that are in a different class from the three-cell lights. The SureFire G2 Nitrolon and the Brinkmann Maxfire LX both operate on just two 123A cells, using Xenon bulbs like the more powerful lights. While not as useful as a spotlight for examining a distant shore, the two-cell units are plenty adequate to meet the safety requirements of a bright light to signal other vessels, providing more output than a four D-cell flashlight in a package small enough to easily fit in a PFD pocket or chart case. Both of these lights remained dry in the same immersion test I used for the larger lights. 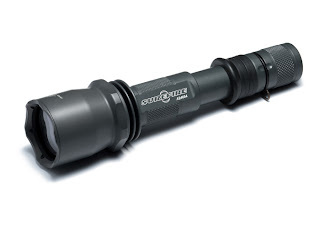 The SureFire G2 sells for $36 and has a 65-lumen lamp that runs for 60 minutes. There’s an optional 120-lumen lamp available that provides 20 minutes of run-time. The tough polymer case is 4.9 inches long, and the switch works the same as the M3, with a rotating tailpiece that also features push-button momentary on. The Brinkmann Maxfire LX comes in a rubberized polymer case 5.5 inches long. The output power of the Xenon bulb is not given in the information packaged with the Maxfire, but in my tests, it seemed equal in every way to the SureFire G2, including run-time. One key difference is the lack of the rotating tailpiece switch found on all the other lights tested. The Maxfire uses a simple push-button switch in the tailpiece, working as a momentary on switch when lightly depressed and full on after pushing hard enough to click. I like this switch better than the rotating ones because it’s easy to activate with one hand from any position. This high-powered flashlight is also a bargain compared to the others tested, available at discount department stores for about $16 to $20. It comes with two Sanyo 123A batteries in the package. Having tested this new breed of compact, high-power flashlights, I can’t imagine being without one in the future—not only for sea kayaking, but as a great emergency light to carry in a vehicle or to use while sailing, hiking or any other outdoor activity. All the lights tested are better than anything I’ve used in the past. I’ll definitely pick up a Maxfire or G2 for all-around general use and probably one of the powerful three-cell units like the M3 Combat light for nighttime navigation. It’s also worth noting that if you don’t mind spending even more money and carrying a slightly bigger flashlight, SureFire and other companies offer tactical lights that use four and even six 123A cells, claimed to be powerful enough to function as handheld searchlights. Check out the High Intensity Cree type LEDs such as the Fenix AA models. They match the Surefire cr123a powered lights and use 1,2,6 AA batteries. You are so right about having a high-intensity LED on you. I always carry a Fenix P2D (1 CR123a). Lights go out in the public bathroom or mall? No problem! I dislike 123A flash lights because you gotta buy special batteries for them. I'd rather go with AA's. 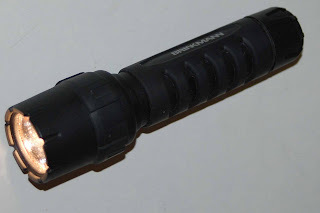 http://www.knifeup.com/best-survival-flashlight/ has a good review.